The tourist information resource for Gibraltar , Spain. 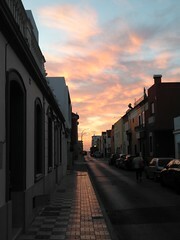 Search apartments and villas direct from the owners, hotels, video's, pictures and many more ..
La Linea de la Conception, sunset. This is the last village in Spain on the border with Gibraltar. Gibraltar is a British overseas territory. It is located on the south of the Iberian Peninsula, overlooking the Strait of Gibraltar which links the Atlantic Ocean to the Mediterranean Sea. The territory shares a land border with Spain to the North. Gibraltar has historically been an important base for the British Armed Forces and is the site of a British naval base.The name of the Territory comes from the Arabic name Jabal aÅ£-Å¢Äriq (Ø¬Ø¨Ù Ø§ÙØ·Ø§Ø±Ù), meaning "mountain of Tariq". It refers to the Berber Umayyad general Tariq ibn-Ziyad, who led the Moorish invasion of Iberia in 711. Earlier, it was known as Calpe, one of the Pillars of Hercules. Today, Gibraltar is known colloquially as "Gib" or "the Rock".The sovereignty of Gibraltar is a major issue of contention in Anglo-Spanish relations. Spain requests the return of sovereignty, ceded by Spain in perpetuity in 1713. Any transfer has been consistently and totally rejected by almost all Gibraltarians. of Gibraltar]]Human settlement in Gibraltar can be traced back to the Phoenicians around 950 BC, although there is earlier evidence of habitation by the Neanderthals, an extinct species of the Homo genus. Semi-permanent settlements were later established by the Carthaginians and Romans. After the collapse of the Roman Empire, Gibraltar came briefly under the control of the Vandals, and would later form part of the Visigothic Kingdom of Hispania until its collapse due to the Muslim conquest in 711 AD. At that time, Gibraltar was named as one of the Pillars of Hercules, after the legend of the creation of the Straits of Gibraltar.On April 30, 711, the Umayyad general Tariq ibn Ziyad led a Berber-dominated army across the Strait from Ceuta. He first attempted to land at Algeciras but failed. Subsequently, he landed undetected at the southern point of the Rock from present-day Morocco in his quest for Spain. Little was built during the first four centuries of Moorish control.The first permanent settlement was built by the Almohad Sultan Abd al-Mu'min, who ordered the construction of a fortification on the Rock, the remains of which are still present. Gibraltar would later become part of the Taifa Kingdom of Granada until 1309, when it would be briefly occupied by Castilian troops. In 1333 it was conquered by the Marinids who had invaded Muslim Spain. The Marinids ceded Gibraltar to the Kingdom of Granada in 1374. Finally, it was reconquered definitively by the Duke of Medina Sidonia in 1462, ending 750 years of Moorish control.In the initial years under Medina Sidonia, Gibraltar was granted sovereignty as a home to a population of exiled Sephardic Jews. Pedro de Herrera, a Jewish converso from CÃ³rdoba who had led the conquest of Gibraltar, led a group of 4,350 Jews from CÃ³rdoba and Seville to establish themselves in the town. A community was built and a garrison established to defend the peninsula. However, this lasted only 3 years. In 1476, the Duke of Medina Sidonia realigned with the Spanish Crown; the Sefardim were then forced back to CÃ³rdoba and the Spanish Inquisition. Gibraltar would not pass under the hands of the Spanish Crown until 1501. One year later, the Catholic Monarchs Ferdinand and Isabella granted Gibraltar a coat of arms., Battle of Gibraltar. ]]The naval Battle of Gibraltar took place on 1607-04-25 during the Eighty Years' War when a Dutch fleet surprised and engaged a Spanish fleet anchored at the Bay of Gibraltar. During the 4-hour action, the entire Spanish fleet was destroyed.During the War of the Spanish Succession, British and Dutch troops, allies of Archduke Charles, the Austrian pretender to the Spanish Crown, formed a Confederate fleet and attacked various towns on the southern coast of Spain. On 4 August 1704, after six hours of bombardment starting at 5 a.m., the confederate fleet, commanded by Admiral Sir George Rooke, captured the town of Gibraltar in the name of the Archduke Charles. 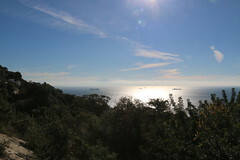 Terms of surrender were agreed upon, after the majority of the population (some four thousand) chose to leave Gibraltar and sought refuge in surrounding areas such as the hermitage of San Roque, Los Barrios, and the nearby abandoned town of Algeciras.Franco-Spanish troops failed to retake the town, and British sovereignty over Gibraltar was subsequently recognised by the 1713 Treaty of Utrecht, which ended the war. 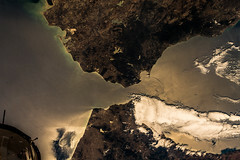 Spain ceded Gibraltar and Minorca to the United Kingdom, which has retained sovereignty over the former ever since, despite all attempts by Spain to recapture it.Gibraltar subsequently became an important naval base for the Royal Navy and played an important part in the Battle of Trafalgar. Its strategic value increased with the opening of the Suez Canal, as it controlled the important sea route between the UK and its colonies in India and Australia. During World War II, the civilian residents of Gibraltar were evacuated, and the Rock was turned into a fortress. An airfield was built over the civilian racecourse. Guns on Gibraltar controlled the entrance to the Mediterranean Sea, but plans by Nazi Germany to capture the Rock, codenamed Operation Felix, were frustrated by Spain's reluctance to allow the German Army onto Spanish soil. Germany's Admiral Wilhelm Canaris, head of the Abwehr, also helped by filing a pointedly negative assessment of the options. Canaris was a leader of the German high command resistance to Hitler, and it is thought that he frustrated the attack to limit Germany's aggression.In the 1950s, Spain, then under the dictatorship of Francisco Franco, renewed its claim to sovereignty over Gibraltar, sparked in part by the visit of Queen Elizabeth II in 1954 to celebrate the 250th anniversary of the Rock's capture. For the next thirty years, Spain restricted movement between Gibraltar and Spain. A referendum was held on September 10, 1967, in which Gibraltar's voters were asked whether they wished to either pass under Spanish sovereignty, or remain under British sovereignty, with institutions of self-government. The vote was overwhelmingly in favour of continuance of British sovereignty, with 12,138 to 44 voting to reject Spanish sovereignty. In response, Spain completely closed the border with Gibraltar and severed all communication links.In 1981 it was announced that The Prince and Princess of Wales would fly to Gibraltar to board the Britannia as part of their honeymoon. In response, the Spanish King, Juan Carlos I refused to attend their wedding in London.In 1988, SAS troops foiled an attempted terrorist attack on the British Army Garrison by members of the IRA, an event that was subsequently the subject of a controversial British television documentary, Death on the Rock.The border with Spain was partially reopened in 1982, and fully reopened in 1985 after Spain's accession into the European Community. Joint talks on the future of the Rock held between Spain and the United Kingdom have occurred since the late 1980s, with various proposals for joint sovereignty discussed. However, another referendum organised in Gibraltar rejected the idea of joint sovereignty by 17,900 (98.97%) votes to 187 (1.03%). The British Government restated that, in accordance with the preamble of the constitution of Gibraltar, the "UK will never enter into arrangements under which the people of Gibraltar would pass under the sovereignty of another state against their freely and democratically expressed wishes." The question of Gibraltar continues to affect Anglo-Spanish relations. , Sir Francis Richards. ]]As an overseas territory of the UK, the head of state is Queen Elizabeth II, who is represented by the Governor of Gibraltar. The UK retains responsibility for defence, foreign relations, internal security, and financial stability. The Governor is not involved in the day-to-day administration of Gibraltar, and his role is largely as a ceremonial head of state. The Governor officially appoints the Chief Minister and government ministers after an election. He is responsible for matters of defence, security, and the Royal Gibraltar Police. A new governor, Lt General Sir Robert Fulton KBE, is set to replace Sir Francis Richards in September 2006. .On 17th July 2006 Sir Francis left on HMS Monmouth leaving the symbolic keys of the fortress of Gibraltar with the Deputy Governor.The Government of Gibraltar is elected for a term of four years. The unicameral House of Assembly consists of fifteen elected members, eight Government members, seven opposition members, and two ex-officio members appointed by the Governor, the Financial Development Secretary, and the Attorney-General. The speaker is nominated by the Government.The head of Government is the Chief Minister, currently Peter Caruana. There are three political parties currently represented in the House of Assembly: the Gibraltar Social Democrats, the Gibraltar Socialist Labour Party, and the Gibraltar Liberal Party.New Gibraltar Democracy and the Progressive Democratic Party have been formed since the 2003 election. The Reform Party and Gibraltar Labour Party, having failed to achieve any popular support, ceased operating in 2005.Gibraltar is a part of the European Union, having joined under the British Treaty of Accession (1973), with exemption from some areas such as the Customs Union and Common Agricultural Policy.After a ten year campaign to exercise the right to vote in European Elections, from 2004, the people of Gibraltar participated in elections for the European Parliament as part of the South West England constituency. As a result of the continued Spanish claim, the issue of sovereignty features strongly in Gibraltar politics. All local political parties are opposed to any transfer of sovereignty to Spain, instead supporting self-determination for the Rock. This policy is supported by the main UK opposition parties. In view of the UK Government's repeated commitment to respect the wishes of the people of Gibraltar, as laid out in the Constitution, the proposal for joint sovereignty is now considered dead.In March 2006 Jack Straw announced that a new Gibraltar constitution had been agreed upon and would be published prior to a referendum on its acceptance in Gibraltar that year.In July 2006, Geoff Hoon Minister for Europe, in a statement to the UK Parliament confirmed that the new Constitution confirms the right of self-determination of the Gibraltarian people. The territory covers 2.53 square miles (6.543 kmÂ²). It shares a three-quarter of a mile (1.2 km) land border with Spain and has 7Â½ miles (12 km) of shoreline. 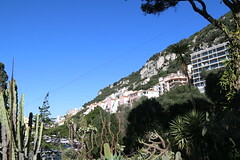 There are two coasts (sides) of Gibraltar – the East Side, which contains the settlements of Sandy Bay and Catalan Bay, and the West Side, where the vast majority of the population lives.The climate is Mediterranean with mild winters and warm summers. 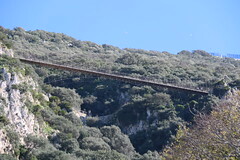 Its terrain is a narrow coastal lowland bordering the 1,397.6 foot (426 m) high Rock of Gibraltar.It has negligible natural resources and limited natural freshwater resources, until recently using large concrete or natural rock water catchments to collect rain water. 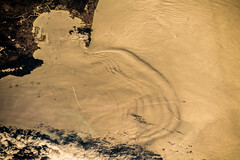 It now has a desalination plant using reverse osmosis, built into the Rock itself.http://www.aquagib.gi/gibraltar_water_supply.htmlGibraltar is one of the most densely populated territories in the world, with approximately 11,154 people per square mile (4,290/kmÂ²). The growing demand for space is being increasingly met by land reclamation, which comprises approximately one tenth of the territory's total area.The Rock itself is made of limestone and is 1,396 feet (426 m) high. It contains many miles of tunnelled roads, most of which are operated by the military and hence closed to the public. Most of its upper area is covered by a nature reserve, which is home to around 250 Barbary Macaques, the only wild monkeys in Europe. Recent genetic studies and historical documents point to their presence on the Rock before the British capture. Superstition holds that if ever the monkeys leave, so will the British; as a result, they are well looked after by the government (a situation rather analogous to the ravens of the Tower of London).
.]]The British military traditionally dominated the economy of Gibraltar, with the naval dockyard providing the bulk of economic activity. This has however diminished in the last twenty years, and it is estimated to account for only 7% of the local economy, compared to over 60% in 1984.Today, Gibraltar has an extensive service-based economy, dominated by financial services and tourism. Referred as an International Finance Centre Gibraltar Financial Services Commission Building a good reputation, Gibraltar was among 35 jurisdictions identified by the OECD as a Tax haven in June 2000 OECD, March 2002 Gibraltar Commits to Co-operate with OECD to Address Harmful Tax Practices. Retrieved on July 2006. As a result of having made a commitment in accordance with the OECD's 2001 Progress Report on the OECD's Project on Harmful Tax Practices, Gibraltar will not be included in the next OECD's list of unco-operative tax havens . It has also never been listed on the FATF Blacklist of unco-operative countries in the fight against money laundering. It may also be referred to as an Offshore Financial Centre, by international institutions such as the IMF IMF, June 4, 2006 Offshore Financial Centers (OFCs): IMF Staff Assessments. Retrieved on July 2006.Fiscal advantages, including no tax on capital income, are offered to the over 8.000 offshore qualified companies registered in Gibraltar GibraltarOffshore.com Gibraltar Exempt Company Registration Changes. Retrieved on July 2006. After an agreement with the European Union in 2005, this tax-exempt regime is due to disappear on the 31st of December 2010 .Financial services and persons involved in the industry are regulated by the Financial Services Commission, which operates in a similar manner to the United Kingdom Financial Services Authority.A number of British and international banks have operations based Gibraltar. Recently, a number of large bookmakers and online gaming operators have relocated to Gibraltar, to benefit from operating in a well regulated jurisdiction with a favourable tax regime.Tourism is also a significant industry. 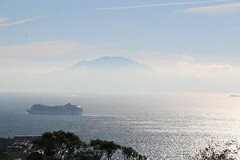 Gibraltar is a popular stop for cruise ships and attracts day visitors from resorts in Spain. The Rock is a popular tourist attraction, particularly among British tourists and residents in the southern coast of Spain. It is also a popular shopping destination, and all goods and services are VAT free. 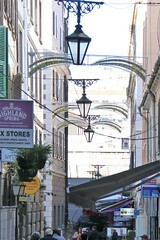 Many of the large British high street chains have branches in Gibraltar, including Marks and Spencer, BHS, Dorothy Perkins, and the supermarket Morrisons.Other areas of activity are services related to shipping, like bunkering, and ship repair and construction. The economy is considered to be strong and diversified.http://www.gibraltar.gov.gi/latest_news/topical_speeches/economy_speech_2005.htmFigures from the CIA World Factbook show that Gibraltar has a GDP of over Â£432 million ($769 million) with a per capita figure of Â£15,700 ($28,000). The main export markets in 2004 were France (19.4%), Spain (14.1%), Turkmenistan (12.1%), Switzerland (11.7%), Germany (10.1%), the United Kingdom (9.1%), and Greece (6.8%).The unit of currency in use is the Pound Sterling with notes issued by the Government of Gibraltar although there is an ISO code of GIP for the Gibraltar Pound. The population of Gibraltar was 27,884, (2005) and has been fairly constantaround that number.The Gibraltarians are often mistakenly described as English or Spanish, but they are a racial and cultural fusion of the many European immigrants who came to the Rock over 300 years.Gibraltarians are the descendants of economic migrants that came to Gibraltar after the majority of the Spanish population left in 1704 (185 Spaniards remained in 1753). Genoese, Maltese, and Portuguese formed the majority of this new population, with other groups including Minorcans, Sardinians, Sicilians, French, Germans, Italians, and, of course, the British. More recent history has seen an increase in Spanish nationals as the border became more relaxed and people could travel to the territory more easily.The main religion is Christianity, with the majority of Gibraltarians belonging to the Roman Catholic Church. 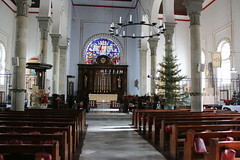 Religious minorities include the Church of England, as well as a long established Jewish community, a number of Hindu Indians, and a Moroccan Muslim population.The official language is English, which is the used for government and business purposes. The majority still also use Castilian Spanish. Many locals also use Llanito, a mixture of English and Andalusian Spanish, incorporating some words not native to either. The culture of Gibraltar reflects Gibraltarians' diverse origins. While there are Andalusian and British influences, the ethnic origins of most Gibraltarians are not confined to British or Andalusian ethnicities. 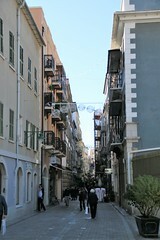 Most ethnicities include Genoese, Maltese, Portuguese, and Germans. A handful of other Gibraltar residents are Jewish of Sephardic origin, North African, or Hindu.British influence remains strong. 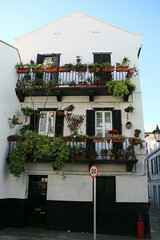 Although Gibraltarians often speak to each other in an English-influenced Andalusian dialect called Yanito or Llanito, English is the language of government, commerce, education, and the media. Gibraltarians going on to higher education attend university in the UK. Patients requiring medical treatment not available on the Rock receive it there as private patients paid for by the Gibraltar Government.Gibraltar celebrates its National Day annually on September 10th, the date chosen to commemorate the 1967 Referendum which was the first act of self-determination of the people of Gibraltar. Despite the political undertones of the day, it is very much a festive occasion. In 2004 Gibraltar celebrated the tercentenery of its capture by the British and to honour them for their effort, and the long association as a naval base, awarded the freedom of the City to the Royal Navy.As a political gesture of solidarity, almost the entire population took to the streets dressed in red, white and blue and linked hands to form a human chain encircling the rock. Gibraltar has a digital telephone exchange supported by a fibre optic and copper infrastructure. The telephone operator Gibtelecom also operate a GSM network.International subscriber dialling is provided, and Gibraltar was allocated the access code 350 by the International Telecommunication Union. This works from all countries with IDD, apart from Spain which insists on using 9567 as an access code due to the telecom disputeDial-up, ADSL, and high speed Internet lines are available along with wifi hotspots in the hotels. The Gibraltar Broadcasting Corporation operate a television and radio station on UHF, VHF, Medium Wave and with Internet streaming of the radio service. 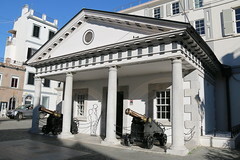 The army garrison is provided by the Royal Gibraltar Regiment, originally a part-time reserve force which was placed on the permanent establishment of the British Army in 1990. The regiment includes full-time and part-time soldiers recruited from Gibraltar, as well as British Army regulars posted from other regiments.The Royal Navy maintains a squadron at the Rock. The squadron is responsible for the security and integrity of British Gibraltar Territorial Waters (BGTW). The shore establishment at Gibraltar is named Rooke after Sir George Rooke who captured the Rock for Archduke Charles (pretender to the Spanish throne) in 1704. Gibraltar's strategic position provides an important facility for the Royal Navy and Britain's allies. Ships from the Spanish Navy do not call at Gibraltar.British and US nuclear submarines frequently visit the Z berths at Gibraltar (source: Hansard). A Z berth provides the facility for nuclear submarines to visit for operational or recreational purposes, and for non-nuclear repairs.The Royal Air Force station at Gibraltar forms part of Headquarters British Forces Gibraltar. Although aircraft are no longer permanently stationed at RAF Gibraltar, a variety of RAF aircraft make regular visits to the Rock and the airfield also houses a section from the Met Office.The Rock is believed to be a SIGINT listening post for telecommunications throughout North Africa, and because of its strategic location it still remains a key base for NSA and GCHQ coverage of the Mediterranean.The Naval Base played a part in the Falklands war and there was an aborted plan Operation Algeciras to attack shipping in the harbour using frogmen. In 1988 the British SAS killed three unarmed Provisional IRA volunteers, MairÃ©ad Farrell, Sean Savage and Daniel McCann in Gibraltar as part of Operation Flavius. They were in Gibraltar on a PIRA operation to plant a car bomb. A car hired by the three was subsequently discovered with 100 lb of Semtex explosive. This incident was the subject of a contentious Thames Television documentary, Death on the Rock.The families of the deceased took the case to the European Court of Human Rights. In 1995 the court held by ten votes to nine that the British Government had violated Article 2 of the Convention. It also ruled that the three had been engaged in an act of terrorism, and consequently dismissed unanimously the applicantsâ claims for damages, for costs and expenses incurred in the Gibraltar Inquest and the remainder of the claims for just satisfaction. Every year Gibraltar celebrates its National Day on 10th September to commemorate the 1967 referendum where with a massive majority the people of Gibraltar voted to reject annexation by Spain.The day is a public holiday, and most Gibraltarians participate by dressing up in the National Colours of red and white and attending the political rally and other events held that day.The political rally culminates with the release of 30,000 red and white balloons representing the number of people of Gibraltar.A good description of the occasion by a regular visitor is:"Gibraltar's national day, 10 September, is a magnificent celebration not only of Gibraltarians' pride in being British but of their love of their homeland." :Andrew Rosindell MP, speaking in the House of Commons 21 Jun 2006. After a protracted legal battle it seems Gibraltar National Football Team will be joining "Two weeks ago we were forced to overturn our decision not to accept Gibraltar as a full member of UEFA," Senior UEFA official Jacob Erel noted commenting on a ruling from the Court of Arbitration for Sport (CAS) .